Anyway, a happy New Year to all, and I hope Santa was kind. We spent Christmas week here in Caithness, which meant battening all available hatches and enduring wave after wave of low pressure systems sweeping across the UK, bringing with them storm force winds and floods. Parts of Britain are so wet you might as well start gathering two of every animal and taking up carpentry. Actually, the winds were pretty severe. I joked elsewhere that it was like having someone rev up the engines of a 747 across the road from you, but there really were times when it felt just like that. We also had a chance to observe God’s version of Pooh Sticks, where He’d select a seagull at random and see how long it took for the wind to deposit it in Greenland (about half an hour, at a conservative estimate). Then , after Christmas, and braving the elements, we went down to the Midlands for Hogmanay with my family—a 1,200-mile round trip made even more worthwhile by the fact that it gets lighter an hour earlier, and darker an hour later, than in Wick (so it’s not just a social call, it also serves as our yearly anti-rickets boost). In gansey news, as you’ll see from the pictures, I’ve managed to fit in a fair bit of knitting these last few weeks. I’ve started the pattern and divided front and back. And am a shade over halfway up the back. 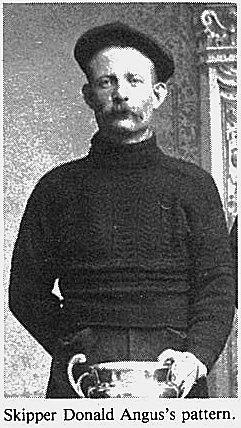 The pattern is Donald Angus of Caithness’s gansey, as featured in Rae Compton and Henrietta Munro’s booklet, “They Lived By The Sea”. 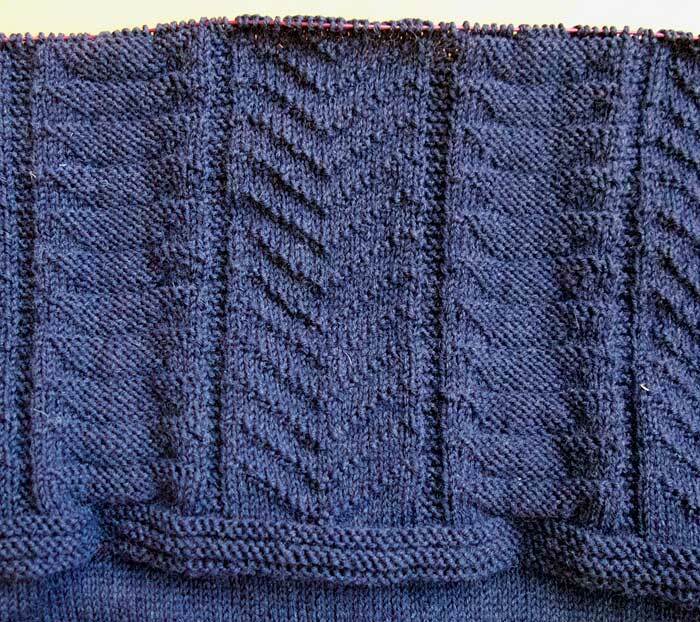 I’ve adjusted the width of the pattern bands to fit my stitches, but otherwise it’s pretty much the same (I’d normally add cables to a pattern like this, but as I plan to give the finished gansey to Wick museum I figure I should stick to the script, for once). It’s a striking pattern and, as Rae Compton observes, it’s hard to believe that such a richly textured effect is achieved only by the use of knit and purl stitches. (It’s very easy to knit, too.) It’s quite different to my usual patterns, but I like it a lot. Now, in our first parish notices of the year, for all of you who asked Gail for pictures of the child’s cardigan she’d made using gansey patterns, she’s sportingly sent us pictures which you can see here, and dead impressive it is too. 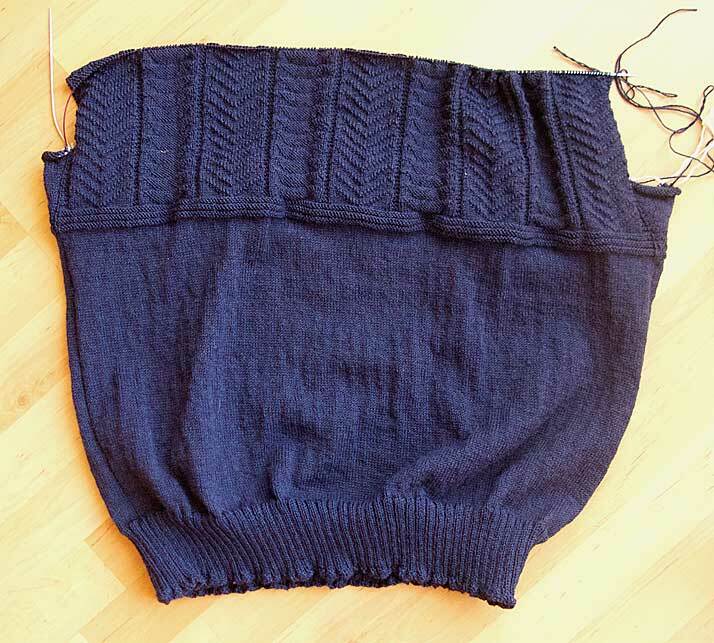 Also, Laura has sent a picture of her completed gansey, a splendid combination of patterns in dark navy (but looking much lighter in the photo). Warmest congratulations to both. Welcome back! And it was well worth the wait – the gansey is looking great. And I can see why you would be tempted to insert the cables between the vertical columns. I would have been too. Happy New Year to you and Margaret. Nice to see you back. At ours Baxter the re-homed black cat performed First Footing quite admirably. Otherwise very wet and stormy in the rural south of England. 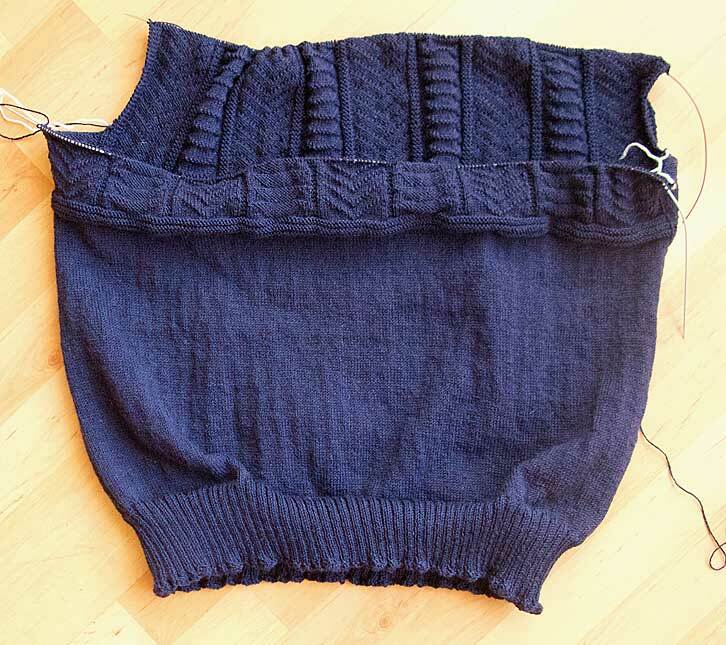 Wonderful progress on the gansey, I like the pattern and in view of its history if I might say I too tend to think less is indeed more. Welcome back, that funny taste in the mouth will go away soon. I’m confused. Why is Donald Angus of Caithness’s pattern charted as “Seahouses”? 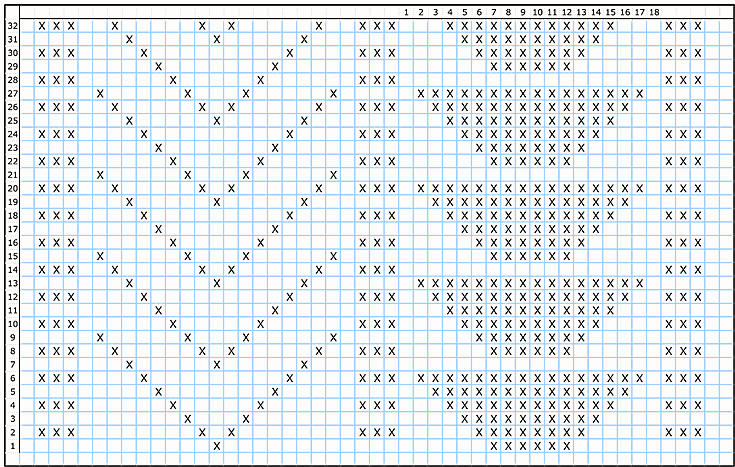 But more important, what the heck is going on with that division band? It tucks in like an inserted ribbon. Sorry about the caption, Tamar – you caught me being typically lazy and re-using the chart spreadsheet from last time! It should be corrected now. Don’t know about the division band – maybe it’ll have to wait till the body is done to see it properly. Actually now I think about the Division Band would be a good name for a 1960s pop group! I keep reading the post titles as Wicked rather than Wick and an associated number, so I will be grateful when you finish this one for purely selfish reasons. It is looking quite lovely, and if I channel my Bostonian roots, I can even say wicked nice, and the whole process will come full circle. Wick takes its name from the Viking word vik, meaning a shallow bay onto which boats can be landed. But by a happy coincidence it could also be a wicked place (“the sodom of the north” is one old term for it, meaning you should be wary of bending over to pick up dropped change), what with 43 bars and all; the fishing boat skippers even used to be part-paid in whisky, bringing a new meaning to pickled herring. We hold the old police records here, and I found it interesting that several prostitutes were arrested in the 1860s, but not for prostitution – just for being drunk and disorderly, or assault. Honestly, it’s so fiddly knitting these flipping’ ganseys I’m amazed they found the time. The word “vik” is still in use in swedish, meaning bay. New gansey looks very nice, I wish I had somebody here who needs a new gansey :). Hello Judit, and happy New Year. Happy New Year to Mr. and Mrs. Reid, long may their knitting needles clack! Congratulations are also due to Gail and Laura, well done! I missed the blog while you were away, so welcome back, Gordon. Do you get up in the morning and sharpen your tongue!? or is it a permanent condition, do you think. My tongue is as God made it, alas. Though if you are ever tempted to try sharpening yours in an electric pencil sharpener, take it from me, you want to have some ice handy, and a bucket!